Mayor Ford Homophobe or A Simple Family Man? I truly advocate the thought process of “Family First” and “Mother/Father Before Employee” attitude. When I first heard that Mayor Ford was not attending the gay pride parade because he was going to the cottage, my first impression was “What a jerk!” However, after reviewing a few articles and Barbara Kay’s article, I realize that this has been a family tradition for Mr. Ford and his family for decades. For that, I fully support his decision to enjoy the Canada Day weekend with his family. He should not be bullied into changing it either. Family Man before Mayor all the way. I do not agree with Barbara Kay when she states that the Pride Event in Toronto is no longer about “support” but about “gay-themed fun” It is complete ignorance if you believe this and I’d advise you to review the comments that were generated from your article. Give your head a shake Barbara. I work in an environment, where even today, it’s a fight for a woman to do anything of management stature. I still hear the vile terminology used in reference to my gay friends amongst my city. Hell, even over-weight people cannot be taken seriously when it comes to certain industries. Prejudice and inequality is as alive today as it was in the past. In conclusion, as I stated, I support Rob Ford’s “Father before Mayor” stance. 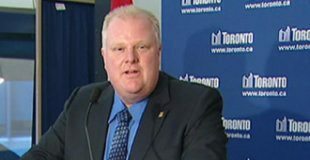 However, if it is that important to have Mayor Ford present, I would highly suggest that next year, the gay pride parade should be shifted a week back to accomodate his family committments. At that point, we will all know if the Spade’s a Spade.